Discussion in 'Birthing, Weaning, and Raising Young Goats' started by Cheryl Petree, Apr 15, 2019. My 8 week old pygmy is doing great, eating and pooping and peeing fine. He was rejected by mom so I am bottle feeding, right now 2x/day 3oz each feeding. He is eating about 1/2 tbsp of goat pellets 2x/day, and has free choice alfalfa/grass mix hay, free choice water, and roams around my yard grazing on various things of interest to him. My question - his stomach seems distended to me. It is not real bad, but feels like it is gassy. 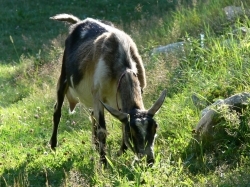 I read on one of these sites that goat bellies are naturally somewhat distended. I gave him about 1/2 tsp of baking soda mixed in water with a syringe (about 1.5cc), but the baking soda settled at the tip of the syringe so he did not get very much. In about a minute he projectile belched up some foul smelling cud. The smell is the typical smell when he just burps it up and starts chewing, so that didn't really alarm me. I also read do not leave baking soda out free choice, just use as needed. He is resting comfortably now, and has never acted like he is in pain. How big should an 8 week old goat's belly be? I notice it is bigger after a day in the yard (of course! ), and goes down during the night, but still seems kinda big and gassy to me. B&B Happy goats and Rammy like this. At eight weeks old your kid should be bottle fed three or four times a day and should be drinking more than 3oz. Per feeding. I have used power goat formula in the past , and have followed advice on this site to use whole cows milk instead....with the whole cows milk my bottle kids drank more and had no digestion issues. Your kid needs milk first, hay and water second, and has plenty of time before he needs pellets. ...feeding on diffrent things that are too rich for him can cause him to bloat.....if my kids have mild bloat, i burp them on the left side or get them up and active so the gas will pass on either end. 3 ounces of milk 2 times a day is not enough for an 8 week old. Not nearly enough. And to add to your confusion... by 8 weeks a pygmy (like a Nigerian) should be getting weaned. Prior to this he should have had 3-4x a day the first 2 weeks then 3x day from 3-6 weeks 2x day 6-8 weeks. after that 1 x day just to wean. Pelleted feed is available by 2 weeks and hay is offered by then as well. I am not sure if you are just reducing as he is older and you are trying to wean him or is this what he has been getting? Sounds like he is eating well with the hay etc. Pictures are very helpful. Pygmy's are round in the belly like a barrel with tiny legs. Sounds like he is eating enough forage if he has cud. As far as baking soda - you can leave it out however it interferes with ammonium chloride which if that is in your feed or if this will be a wether helps with preventing UC (Urinary Calculi) Goats make there own so it really isn't necessary unless there is a problem. Rammy and Southern by choice like this. Sheepshape, Rammy, B&B Happy goats and 1 other person like this. We do feed Nigerians that were 2lbs at birth longer as well. But normal size we wean by 8 weeks because we have to separate the boys and girls becuase of that fertility thing lol Bur ours have been on a quart of milk so they grow well. @frustratedearthmother yeah, they are killing us too! we just had 19 born in less than a week. Not all the same breed so you know how that goes.